An analogy to changes in the automotive industry! Digitization has completely changed the music and entertainment industry. Old value chains were blown up. New players, direct consumer relations and a changed user behavior fundamentally change the market. A similar scenario is predictable for the automotive industry! How did the music industry react - whose market was the first to be challenged by these new opportunities? Which new players and business models have emerged? Which risks exist - and which mistakes were made? What can mobility companies learn from the experience of the music and entertainment industry? Frank Diederichs sheds light on these questions and shows analogies that pose not only dangers, but also opportunities for possible new business models in the automotive industry. 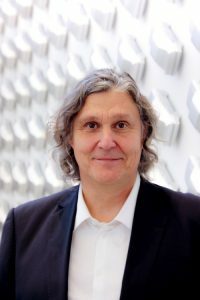 Frank A. Diederichs is future & trend researcher and international university lecturer for digital marketing, e-business and media economics. Media expert and author. Owner of the agency, VIAS PROJECTS 'Munich. With the unit - VIAS FUTURE INSTITUTE - he performs constant monitoring of valid future factors. Participation fee: It is a free event under the initiative #bodenseeinnovativ. The Maybach Seminar is a public event series at the DHBW Ravensburg Campus Friedrichshafen in cooperation with the IWT Institute for Further Education, Knowledge and Technology Transfer, where current topics from the economic and engineering sciences are presented and discussed in one or more lectures. to target group the seminar belongs to the general publicThese include employees of the regional industry, members of the DHBW and other universities, private individuals as well as students in higher semesters. The IWT reserves the right to cancel a seminar if the number of participants is too low or for other valid reasons. It reserves the right to replace a lecturer at short notice. #Bodenseeinnovativ is a funding initiative of the EU and the country. In order to continuously improve the offer for you and to ensure the long-term success of the activities beyond the funding period, we are subject to strict evaluation requirements. The contract for the empirical scientific evaluation was awarded externally to the Friedrichshafen Institute for Family Business (FIF) at Zeppelin University. * Your evaluation statements as well as your personal data are stored separately. Your personal data will be stored at the IWT and the evaluation answers will be sent to the Institute for Family Business of the ZU. Thus, both details can not be linked. Please complete the RSVP confirmation name and email fields. Tickets are not available as this event is over.